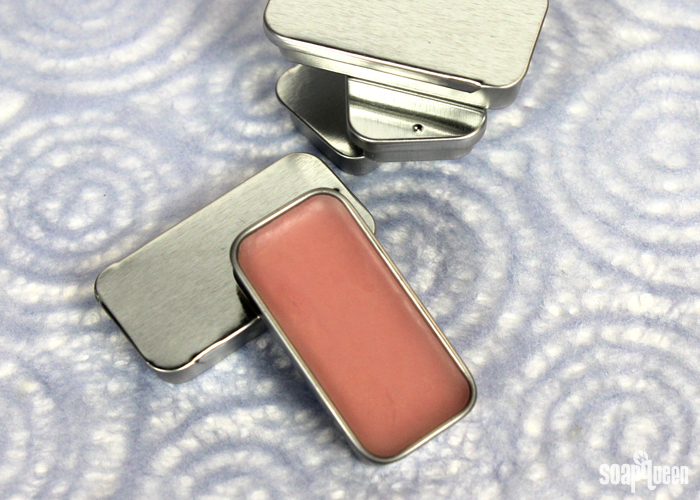 Solid perfume is convenient for traveling, or for touch ups throughout the day. This sophisticated Honeysuckle Solid Perfume has notes of tuberose, nectarine, jasmine and of course, honeysuckle. The Solid Perfume Base makes this project easy to make: melt down the base and add the Heavenly Honeysuckle Fragrance Oil. Made with coconut oil, sweet almond oil and avocado oils, the base also nurtures the skin. A small amount of Rose Gold Mica adds a hint of color to the perfume. If you’re looking for sparkle on the skin, feel free to add more mica. 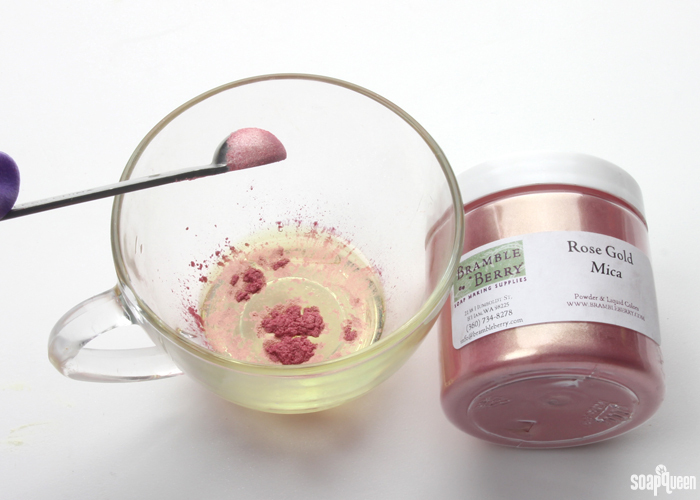 Each order from Bramble Berry during August includes a .5 oz. sample of fragrance oil. Heavenly Honeysuckle Fragrance Oil is the featured fragrance for August. If you are looking for blend ideas for this floral and feminine fragrance, check out the Sample Idea Sheet for August. If you prefer to create your own blend, check out these fragrance blending tips. ONE: In a heat safe container, portion out 2 oz. of Solid Perfume Base. Melt in the microwave on 15 second bursts. TWO: Measure out .5 ounces of Heavenly Honeysuckle Fragrance Oil in a glass container. THREE: Add 1/4 tsp. of Rose Gold Mica to the fragrance oil and stir to combine. This helps the mica mix in evenly with the perfume and prevents clumping. FOUR: Pour the fragrance and color mixture into the melted perfume base and stir until fully incorporated. The mica creates a light pink hue in the perfume, and will not color the skin. If you want the perfume to add slight color and shimmer to the skin, you can increase the amount of mica in the recipe. 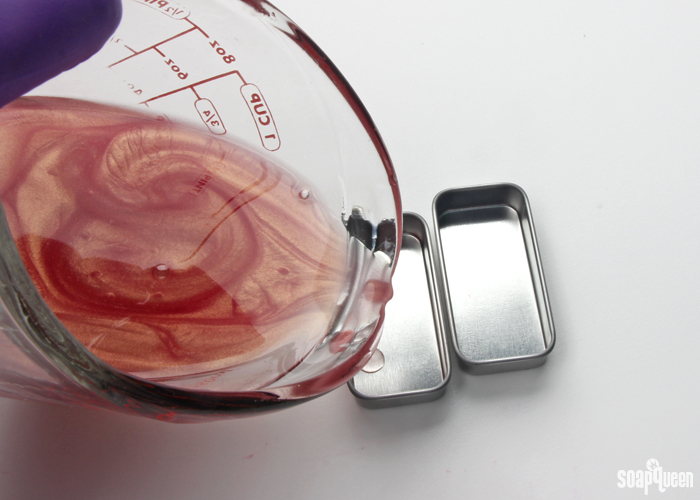 FIVE: Slowly and carefully pour the mixture into the Slidey Lip Tins. Allow the perfume to fully cool and enjoy! Do you prefer solid or liquid perfume? 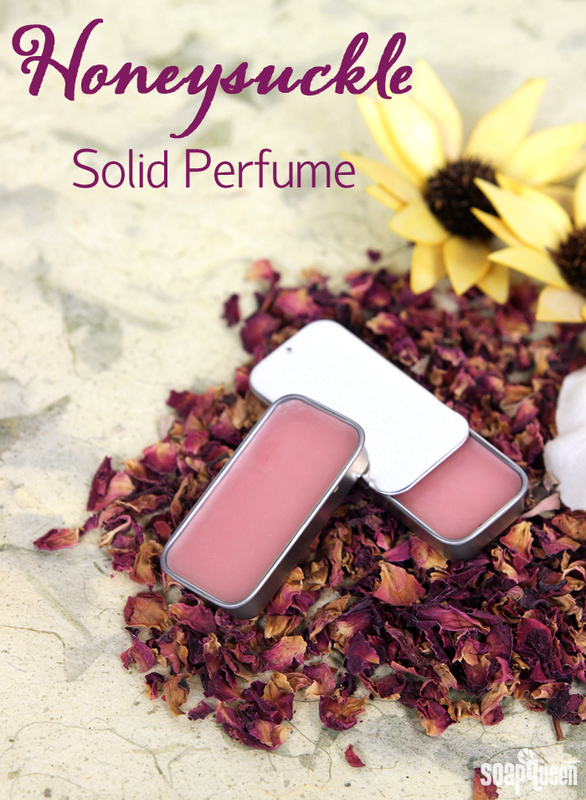 I love solid perfume for traveling! 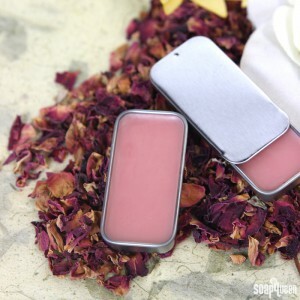 This easy Honeysuckle Solid Perfume smells amazing, and is so easy to make! In a heat safe container, portion out 2 oz. of Solid Perfume Base. Melt in the microwave on 15 second bursts. Measure out .5 ounces of Heavenly Honeysuckle Fragrance Oil in a glass container. Add ¼ tsp. of Rose Gold Mica to the fragrance oil and stir to combine. This helps the mica mix in evenly with the perfume and prevents clumping. 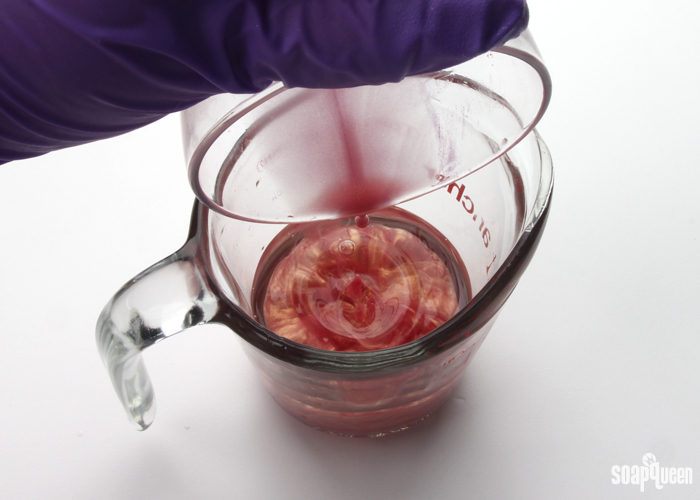 Pour the fragrance and color mixture into the melted perfume base and stir until fully incorporated. The mica creates a light pink hue in the perfume, and will not color the skin. If you want the perfume to add slight color and shimmer to the skin, you can increase the amount of mica in the recipe. Slowly and carefully pour the mixture into the Slidey Lip Tins. Allow the perfume to fully cool and enjoy! I’m sure you’ve already been asked this question & answered it somewhere…but when making a solid perfume…is there any way to add a perfume (from a bottle of spray perfume) that I already have & love. I’ve tried just adding the “notes” that I can find listed online that are in it, but just can’t quite capture it’s true scent. I imagine since it’s probably alcohol based the scent would either rapidly evaporate or just not incorporate correctly. Just wondering. I just made this and it does smell amazing! And so simple to make. Looks great in the round non-stackable plastic containers! Just wondering if the 2oz of solid perfume base is measured out by weight or by volume? And the same for the fragrance oil is that measured by weight or by volume? This is my first time making solid perfume! This smells amazing! I just made it tonight and absolutely love it. I can’t wait to share my extras with family and friends. I’m also excited to experiment with my extra perfume base and make a fragrance for my husband. Thanks for the great idea! Thanks for all your awesome recipes, tips and supplies! I’ve ordered from you since 1998 and am so glad you offer everything you do! I noticed the FO concentration in this perfume is 20%. I know that for my MP soaps and toiletries I use anywhere from 1-3% depending on the EO/FO (CP soaps I go up to 4-6% per total finished batch weight). Can we use the 20% because it’s going on such a small area of the body? How about maximum concentration for perfume if you’re using EOs? Thanks very much! This recipe is designed to leave a nice strong perfume scent on your skin. The fragrance is diluted in the perfume base and usually only applied on the wrists or behind the ears, making the 20% just fine to use. I wouldn’t recommend going higher than 20%, as it may start to irritate the skin. This recipe sounds great! Do you mind sharing the recipe for the perfume base? Are there other ingredients besides the coconut, sweet almond and avocado oils? It uses meadowfoam (very stable shelf life) instead of sweet almond, but of course choise is yours. Thank you! Definitely going to give it a try! If you have any other questions Mary, let me know! I was looking for a solid perfume recipe and stumbled upon this one. Don’t have this particular fragrance and will use another BB one, but I want to thank you for the suggested ratios and the wonderful idea to use color to take the end product to the next level!! 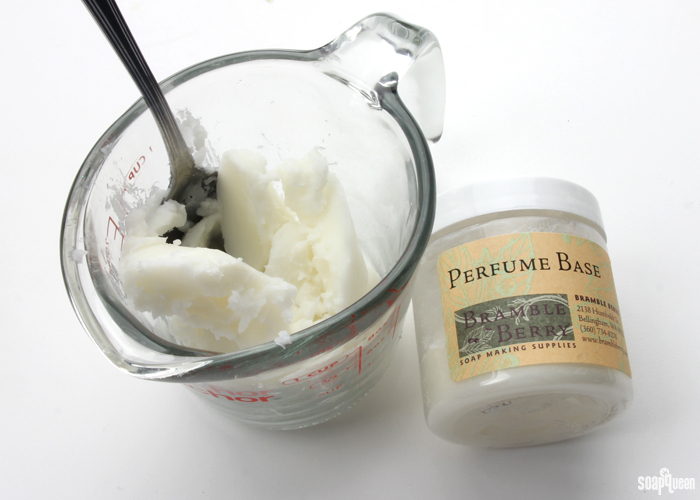 I make a solid vanilla perfume and it’s really handy to use, especially during traveling! I like to make it in a lip balm tube for easy access.